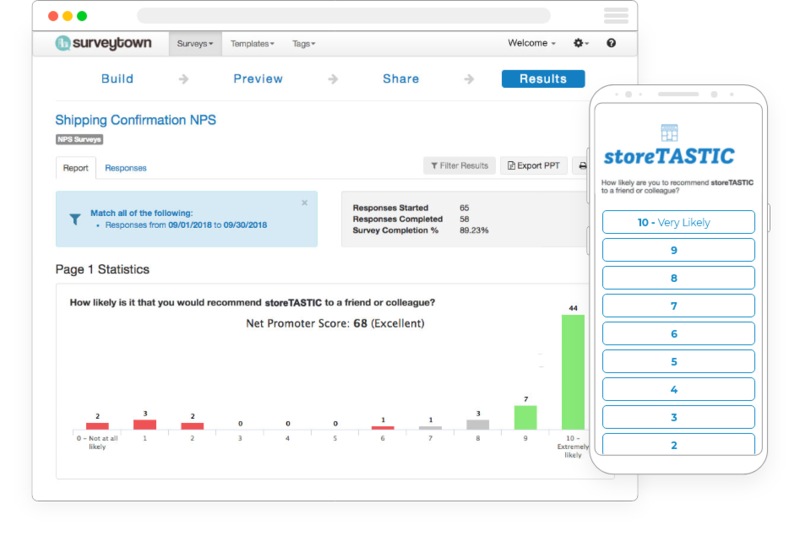 SurveyTown helps you understand your customer experience with customizable Net Promoter Score (NPS), Customer Satisfaction Score (CSAT) and Customer Effort Score (CES) surveys. Hear about and repair negative experiences. Amplify positive experiences by incentivizing customers to share them on social networks. Monitor your performance over time and make great business decisions. Define different success pages based on ratings. Customize the look of your survey. See a complete list of our features. Create an account and get setup in seconds. Three Steps to Survey Success! Use NPS ( Net Promoter Score ) and over 19 different question types to create the perfect survey and personalize them to increase your response rates. Send your survey to your post-purchase email list or link it from your checkout pages. Enrich your responses by passing in data that we can add to their responses. View charts on how your respondents answered your questions. Share reports with managers so they can see how they are performing. Export all your responses to spreadsheets for further analysis, sharing or safekeeping. Get real-time feedback on how your service is performing. Monitor your NPS scores and slice-and-dice your data. Integrate survey data with our API and receive Webhook notifications.